A golden sombrero is awarded to a player who manages to strike out four times in a single game (real golden sombrero not included). It's quite the feat unless you're Ryan Howard or Mark Reynolds. Unfortunately, no-hitters and Brian Wilson's beard are all the rage nowadays. Not for me, though. 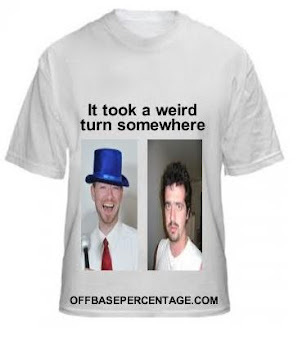 I will pour over the box scores to bring you the finest at swinging and missing. Death, taxes and Ryan Howard Golden Sombreros. I've managed to avoid two of those so far. But Howard just can't seem to stop racking up strikeouts once he steps into the batter's box. Howard apparently enjoyed wearing the giant hat so much on Thursday that he just had to sport it again. I try to do something special for every Howard four strike out gem, so here's a picture of B.A. 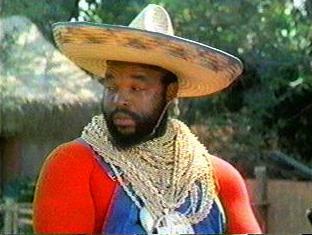 Baracus wearing a sombrero. Top 2nd: Howard struck out looking against Tim Stauffer. He apparently broke ESPN.com at the same time and I couldn't find another pitch-by-pitch account of the game. Okay, I didn't try, you got me. So I just assume Howard watched three pitches and then his batting helmet spun around on his head. Top 4th: Howard struck out swinging against Stauffer. Foul, foul, swinging strike. Damn, I love Howard. Top 6th: Howard struck out swinging against Stauffer again. He did manage to get to a full count before striking out. So this at bat wasn't as much fun. Top 9th: Howard struck out swinging against Heath Bell. I like that he didn't need the extra innings for the sombrero. That's a classy move. Top 11th: Howard hits the go ahead two-run double that put the Phills up for good. He even got to be the hero.